From the aspirations of two young teenagers who wanted to build karts and rally cars, came the dreams of producing the ultimate off-road buggy. Using their own engineering expertise and knowledge, the first Rage buggies where developed and crafted by hand back in 2000. From their childhood dreams emerged a brand and product range respected and recognized worldwide. From humble beginnings we now design, manufacture and market a world class range of vehicles, sold mainly for private recreational and corporate hospitality users. With our growing international user base we are expanding and producing highly sophisticated off-road, track and road legal vehicles that are meeting the demands of discerning customers from F1 drivers to world rally drivers to high profile celebrities. Rage Motorsport is now also firmly established in competitive motorsport, the RX150 Rallycross derivative now having in its own class in the British Rallycross Championship. In cross country rallying, clients have fielded with success specially adapted versions of the Rage Nytro and R200T. 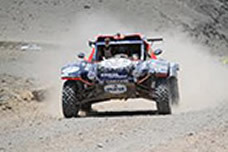 In international motorsport we have vehicles competing in the UTV challenge in Portugal and Kenya who have already proven the exceptional performance, durability and handling under extreme conditions. Our move into international motor sport and the Dakar Rally came via former World Rally Champion, the late Colin McRae and business colleague Christopher Bibb. In 2008 Bibb took a prototype R140T to the Sahara for testing. 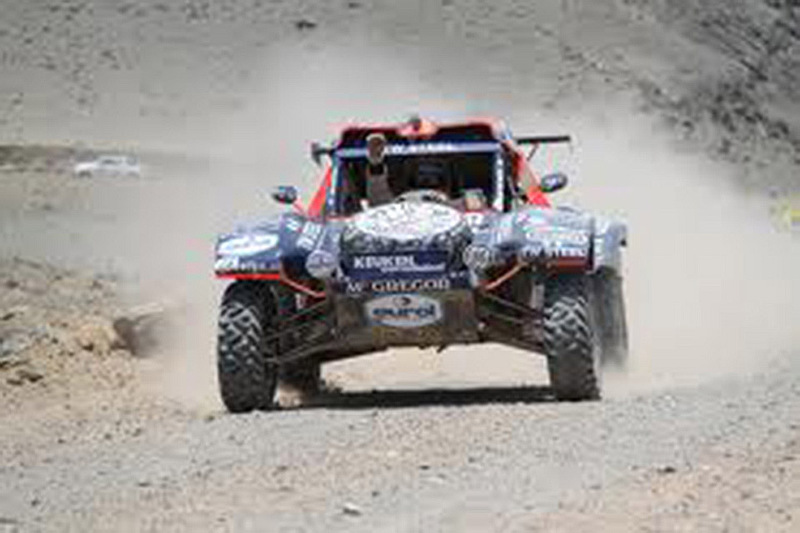 Bibb and the McRae Dakar team then developed the machine to meet FIA regulations and to cope with the rigours of the World’s toughest race – as reported in Car Magazine (December 2010). No less than eight Rage Buggies were entered for the 2010 event, and in the hands of private entrants these cars have now clocked more than 50,000 miles while competing over the past three seasons. It is the feedback and knowledge gained by these endeavors, over the toughest terrain and in fiercely competitive conditions, which give us the confidence to say that Rage products are developed well beyond those of any of any competitors. All of our products incorporate standard features from knowledge gained building our Dakar-developed vehicles which ensures extreme performance, toughness and reliability come standard in all our Rage Buggies. And now we are building these exceptional vehicles in the United States for delivery to customers who demand the best in North America. 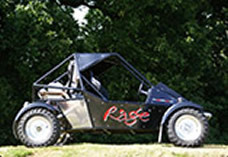 Described by Car magazine as “Manufacturers of weapons grade race and leisure buggies”, the latest Rage machines were conceived with one vision: to offer a uniquely thrilling driving experience. 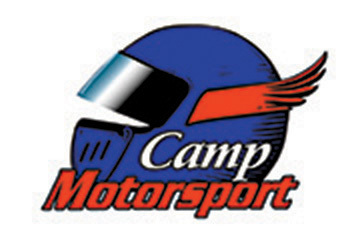 Rage Motorsport NA is based in New Castle, DE. We manufacture the world famous Rage Buggy, sold mainly for private recreational, competition/spec racing and corporate hospitality use in the USA and Canada. If you are looking for the ultimate multi terrain vehicle, then look no further! Having won the XCAR 2013 award for “Bats#*t crazy car of the year”, beating off stiff competition from vehicles such as the BAC Mono and Radical SR3 SL, the Rage Comet ‘R’ is firmly placing itself as being as capable on tarmac as it is off-road. With a quick change of wheels and shock absorber springs the vehicles can be transformed to operate on any terrain thrown at them, something we believe no other vehicle offers, essentially giving you two vehicles in one, a true MTV. The Rage R40TA is the entry vehicle into the Rage lineup. Equally suitable as a private leisure vehicle or for the Corporate Hospitality market, where safety, reliability and strong performance are imperative, this 2 seater is incredibly fun and versatile. 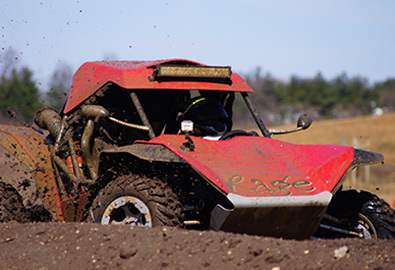 The Rage R200T Buggy is the ultimate Rage Buggy. More power than you can imagine, this machine will truly blow your mind. It is obvious at first glance that this is a Rage, but drive it and you will see that this is something even more special. It is powered using the engine from the ultra-fast Kawasaki ZX14 (ZZR1400) Motorcycle. The R200T gives incredible performance and will launch from 0-60MPH in 3 seconds and on to a top speed of over 125MPH. A sequential gear shifter operates a six speed gearbox. The Rage RT Buggies begin life as the standard off-road buggies. Then they receive a complete lighting package, rims and tires for the tarmac, a horn and a couple other upgrades. The RT's arrive ready for you to hit the track. Their performance on the tarmac is unbelievable and has to be experienced to realize how capable they really are. Whether you prefer a sequential manual or automatic CVT, we've got you covered. 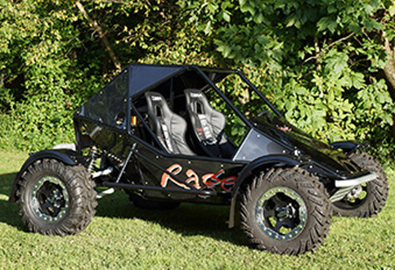 Packed with racing-derived performance and safety technology, as well as power-to-weight ratios that can humble high-end sports cars, Rage Buggies are astounding performers on all types of terrain. Rage prides itself on offering a wide variety of power options for all levels of driving experience: From the 40-HP entry-level model to the fire-spitting R200T with 200 HP at 10,000 rpm, there’s a Rage Buggy that’s right for you! With clever engineering and assorted optional equipment, Rage Buggies can easily transition to all types of four-wheel fun: tarmac, street, off-road, sand and rally. 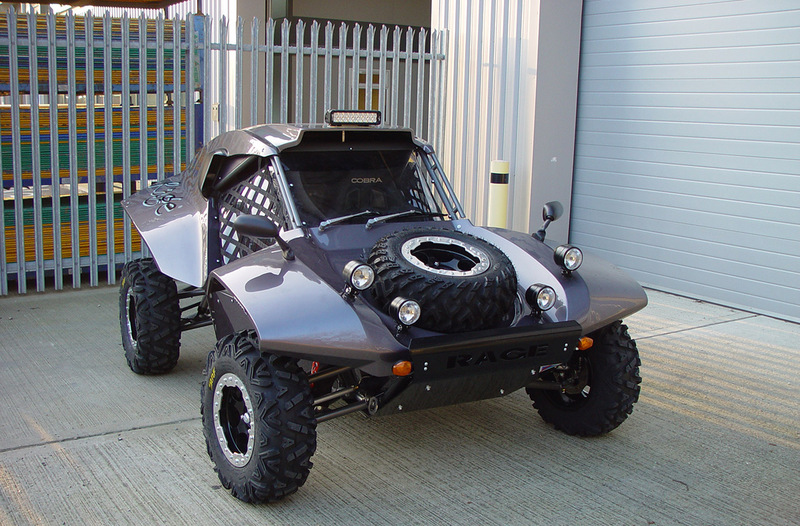 Throughout their development, Rage Buggies have participated in many racing disciplines—from rally stages to the Dakar off-road race—while attracting the attention and praise of numerous champion racers, including late rally legend Colin McRae. The computer-designed, tube-frame chassis that all Rage Buggies share has been engineered to racecar standards and refined through more than a decade of competitive development. Among the many partners that support Rage manufacturing are Intrax (shocks), Quaife (differential box), and Brembo and Wilwood (brakes). 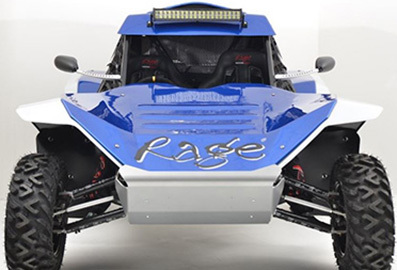 Rage Buggies are incredibly flexible platforms, able to be configured for all forms of driving excitement. 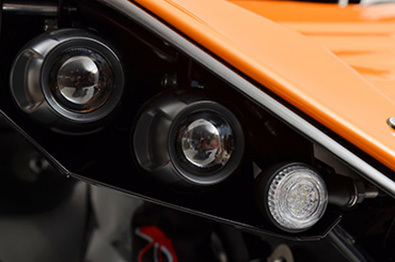 Lighting and safety options enable street legality (depending on your local regulations), while assorted body and drivetrain accessories optimize performance for either track days or off-road stages.